Valdes - 6.5 - Was very active in the first half. Did not make any mistake and that was the reason why Barca went to the half time with a goal lead. Never was called upon in the second half. Was good in dealing with the high balls. Alves - 6 - Looked average today, especially against Adriano. Adriano never let him off the hook in the first half. Defensively he never could tame Adriano. Pique - 5.5 - For me he was the weakest link in the match. Always caught off guard while dealing with Kanoute and fabiano. he was lucky that those two guys weren't on the top of their game. But he was extremely lucky not to be send off. Marquez - 7 - Did not make any mistake in the match. Made sure that he covered his partner regularly. 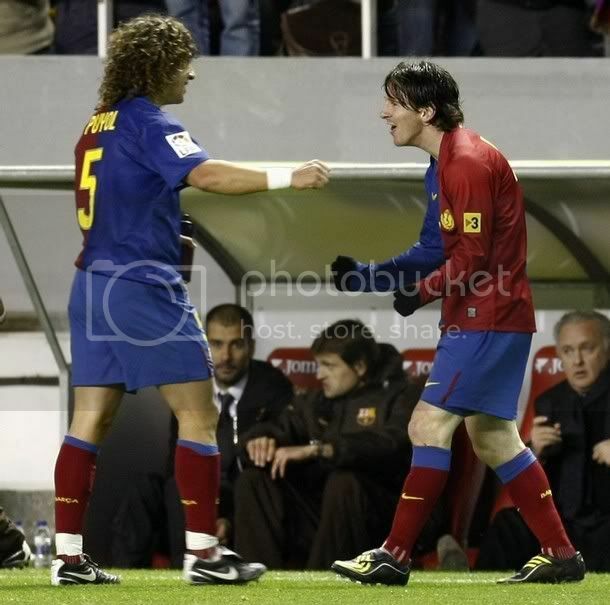 Puyol - 7 - Good game eventhough his problems being a right footed player on the left was exposed in this match. Regualrly came to the rescue of his centre halves. Xavi - 7.5 - Good performance. Was kept quiet early on first half but did come to life. The header to place Messi ahead for the second goal was top class. Toure - 8.5 - For me he was the best player on the pitch especially if you consider the consistency. Won most of challenges and did well while going forward. Another no-nonsense performance. Keita - 5 - Poor performance. May have been over whelmed by the occasion. Messi - 8.5 - Was quiet till the hour mark; but came to life after that. Destroyed the Sevilla defense with his excellent finish. Two season ago we were really worried about his finishing; now thinking of that makes me laugh. Eto - 7.5 - Another great performance. But should not have picked up that yellow card. If there is a word to describe hi it sould be "Poacher". Henry - 7 - Did occupy the left flank really well. But was let down by his own shooting. Whenever he tried to create chances for his team-mates he did well. FC Barcelona notched up their tenth consecutive away victory in all competition with a truly impressive display against Sevilla. Eto scored early in the first half but the victory was sealed by the in-form magician Lionel Messi with his two second half strikes. Actually the entire match can be said as a tale of two halves. FC Barcelona went into the second half with really in back foot eventhough they were leading by a goal. But the second half performance was truly amazine and they completely shut out Sevilla. With Real Madrid losing to Getafe FC Barcelona have opened a huge six points lead with Real Madrid. Guardiola selected his strongest eleven for his toughest challenge since he took charge at Camp Nou. Alves, Pique, Marquez and Puyol formed the back four ahead of Valdes. 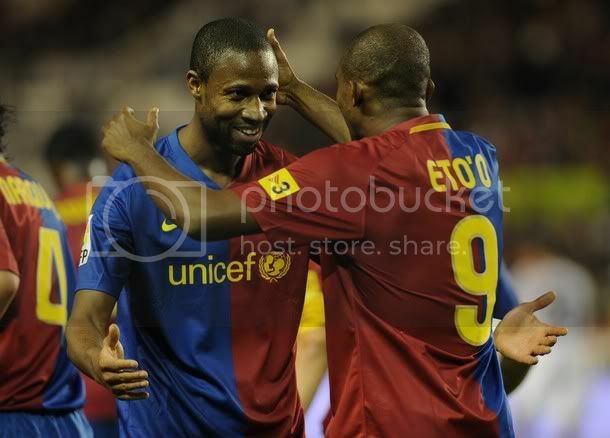 The midfield was rather defensive with both Keita and Toure in along with Xavi. But then that was kind of a sensible decision especially considering how tough it is to play at Sevilla. 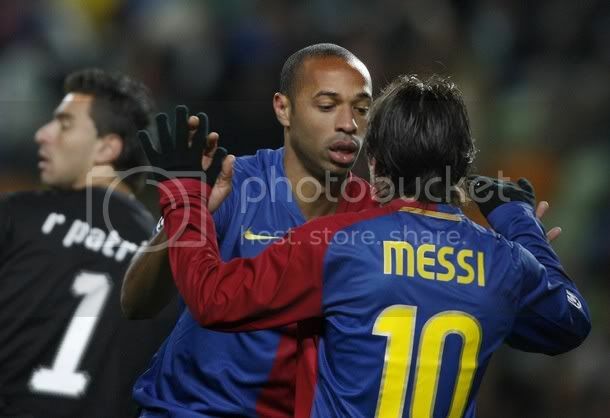 The forward line was as predicted in my preview - Eto, Henry and Messi. This match did threw up some problems. Especially with Puyol; he did job on left defending hardly but was always undone by the fact that he is a roght footed player playing on the left flank. The first half opened pretty slow; both the defenses held their base but slowly the physical strength of Sevilla players along with the tactic of playing ball high was troubling the Barcelona defense. Fabiano regularly got past his markers and it took some desoperate defending to keep him quiet. Adriano on the left flank was destrutive; every move by Sevilla in first half came through him. 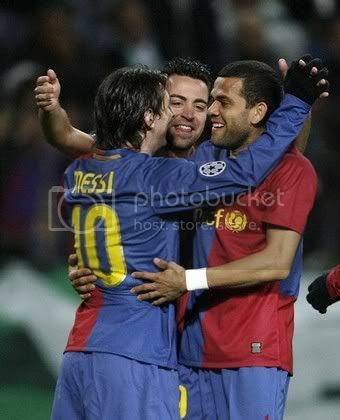 The Sevilla players kept Xavi and Messi under constant check. Messi was so well marked that he has to move to the centre to organise play. The first chance of the half fell to Sevilla when Luis Fabiano touch took the ball high of the bar from a great cross from guess who Adriano in the 8th minute. FC Barcelona's attacks were limited to some shots from outside the box; first it was Henry in the 13th minute who shot high then three minutes later Messi shoot wide of near post. 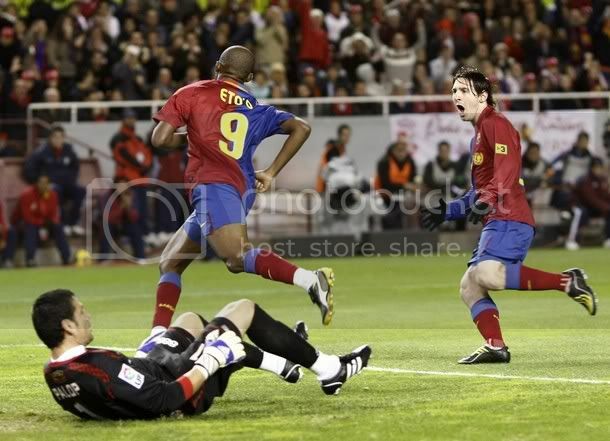 Then in the 20th minute Eto scored to take FC Barcelona 1-0 up. Messi who dropped into the middle played a delightful ball to Xavi; Xavi's pass to alves was intercepted by Navarro and the rebound fell in path of Et; Eto did well to poach on the ball ahead of defense and scored with a great finish. In the 24th minute Fabiano wasted a great chance to equalise when he dragged the ball wide of far post after Kanoute have played him on ahead of defense. In the 28th minute Eto great shot from outside box was saved by Palop. In the 30th minute Eto picked up a silly yellow card for distracting the Goal Keeper Palop while taking a goal kick. That yellow has made sure that he will miss the next match against Valencia. In the 31st minute Henry shot from outside was saved by Palop. In the 42nd minute Kanoute was unlucky not to have equalised after his header from free kick hit the cross bar. That was the luck which Barca needed. I feared Barca would concede more grounds in the second half; but those fears were put to rest from a great team display. The key was to holding on to possession and making the Sevilla attack frustrate. Henry was very much active on the left but his shooting left a lot to be decided. In the 58th minute Alves free kick was saved by Palop. 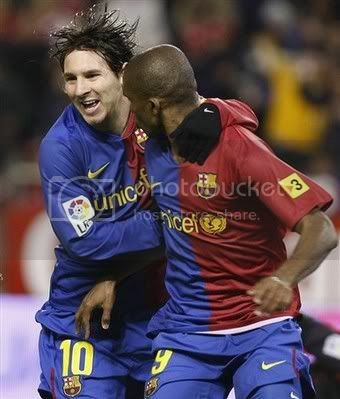 In the 65th minute Henry shot straight at Palop after an excellent run from Messi. In the next minute Henry sent in a great cross from left Sevilla defense conceded the corner. In the 68th minute Messi sets on a great run but his shot was saved by palop. After the hour mark Messi suddenly woke up and was creating havoc on the Sevilla defemse. In the 75th minute Guardiola decided to bring on Busquets in place of a below-par Keita. In the 78th minute Xavi played Messi through with a great header but if the header was great then Messi finish was out of this world. Messi volleyed the ball past a hapless Palop. In the 79th minute Eto wastes a simple chance surprising everyone after a great run from Messi and places the ball to Eto. That should have been a simple finish. 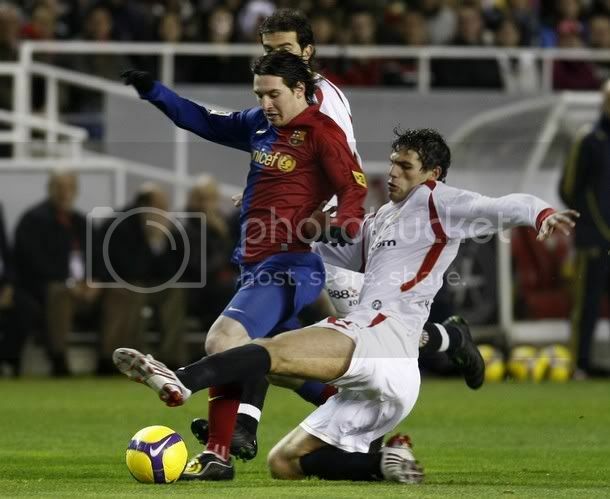 In the 86th minute Fabiano was sent off for an elbow on Busquets. 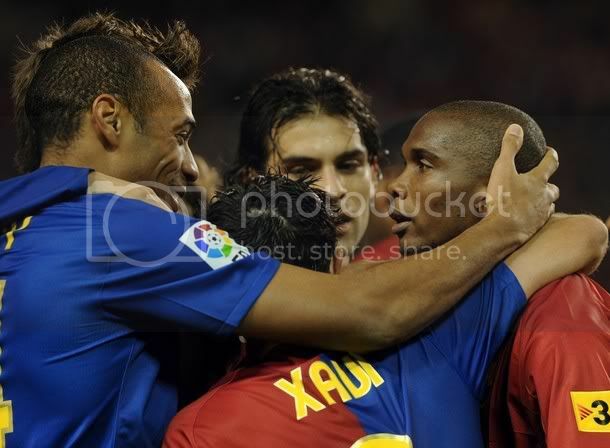 In the 88th minute Gudjonsen replaced Xavi and Then after two minutes Henry was taken off for Hleb. In the 92nd minute Messi capped a brilliant performance with another excelelnt finish after Hleb played a delightful ball tp put Messi ahead of defense; Messi dragged an advancing Palop to the left and put the ball past him tin to the goal with a great finish from a very tight angle. This sensational performance would increase the player's confidence by so much. But they need to keep their feet on ground. 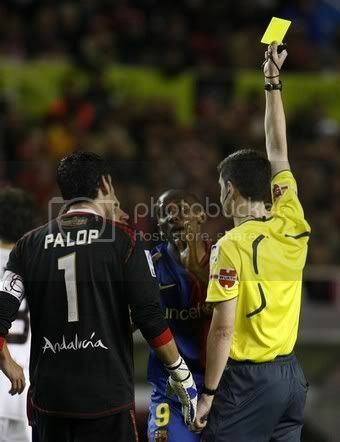 I wasn't that much impressed with Pique; he was lucky not to be sent off and not to have conceded a penalty. With Eto out for match against Valencia it is yet to see how the team cope with that. FC Barcelona's quest for the La Liga title enters a very delicate and important phase with tonight's match against Sevilla. FC Barcelona has been in tremendous form and would be looking to increase their unbeaten record at Sevilla. This has to be Guardiola's buggest test of this season and considering the tough matches which is to follow , a victory at Sevilla would indeed make matters easy. This match has already been billed as the contest between the teams which have the best defensive record and offensive record in the league. Sevilla has let in only eight goals until this seaso; FC Barcelona is not trailing badly here with only conceding nine goals till now. But where Barca's superiority is the amount of goals scored this season; Barca has scored 37 goals to Sevilla's 18. This would be first visit for Keita and Alves who moved from Sevilla to Barcelona this summer. 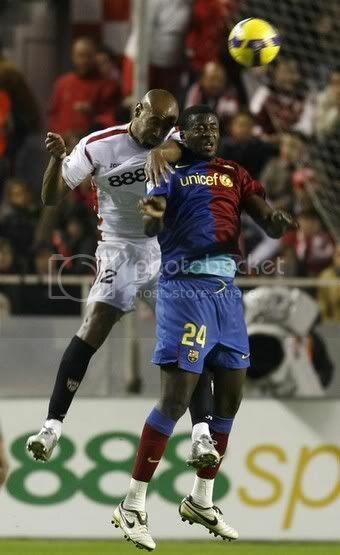 Both the players have been included in the squad along with Toure and Puyol who both were rested. The squad selected by Guardiola is Valdés, Pinto, Henry, Márquez, Xavi, Piqué, Puyol, Cáceres, Sylvinho, Bojan, Eto'o, Messi, Hleb, Dani Alves, Keita, Gudjohnsen, Touré Yaya, Busquets. Valdes is definite to start the match at Goal. But the defense could be a bit tricky to predict. My prediction would be Puyol and Marquez joining hands in the centre with Alves and Caceres on each side. BUt Guardiola could bring in Pique and move Puyol to left. The midfield cou8ld be quite tricky; Guardiola could be tempted to slot in two defensive minded player to shore up the defense. 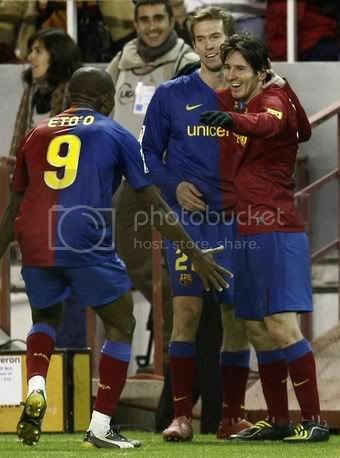 But my opinion is to put Gudjonsen along with Xavi and Toure in the middle. 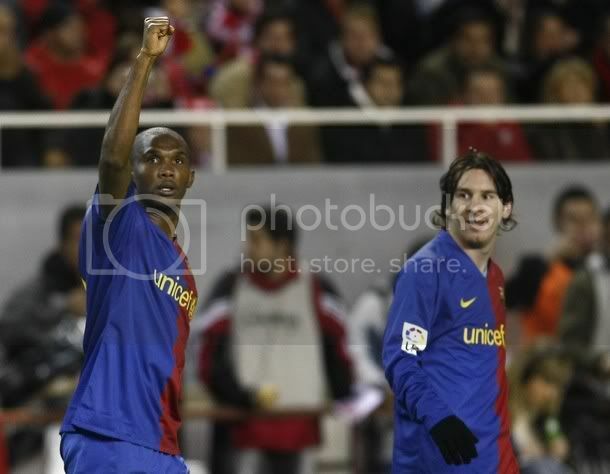 Now against such tough and important match it should be a child's play to predict the front line - Messi, Eto and Henry. 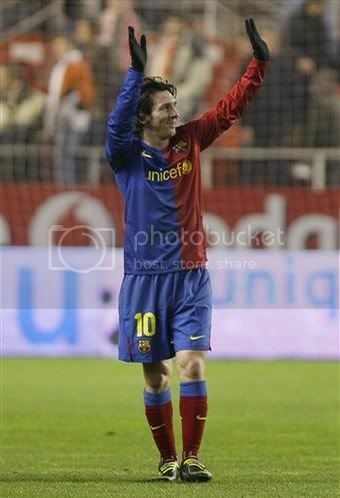 Barca could be seriously tested in today's match but I believe they will prevail and my prediction is 1-3. But it would be very much essesntial for Barca to take the initiative pretty early in the match. They cannot go behind in this match; if that happens we could be chasing the game for majority of the match. FC Barcelona assured themselves of the top spot in their group and hopefully increased their chance of meeting an easier challenge in the second round with an emphatic 2-5 victory against Sporting Lisbon. With both team assured of a second round place the only thing that was at stake was the top spot. There is no guarantee that we will have a easy second round opponent; but there is a high chance of that happening. Hnery, Pique, Messi and Bojan all got into the score sheet; a Caneira own goal completes the tally for Barca. For Lisbon it was Veloso and Leidson who scored the goals. Guardiola fielded a very strong side at Portugal. 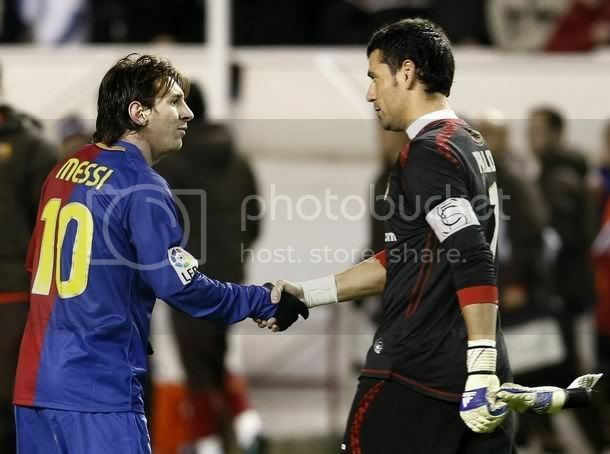 Valdes guarded the goal; in front fo him Alves, Marquez, Pique and Caceres formed the defensive line; the midfield was made up of Xavi, Busquests and Gudjonsen; Messi,Henry and Hleb formed the forward line.The presence of two attack minded players helped FC Barcelona but there is no question of the fact that Messi was the main reason for such emphatic display. This victory would go well for a great display at Sevilla this weekend. FC Barcelona dominated proceedings from the begining. In the 13th minute Busquets stole the ball from Lisbon and the ball reached Messi on the right; Messi unleashed his trademark dribbling run upto the goal line and pulled back the ball to Henry who completed the formalities. 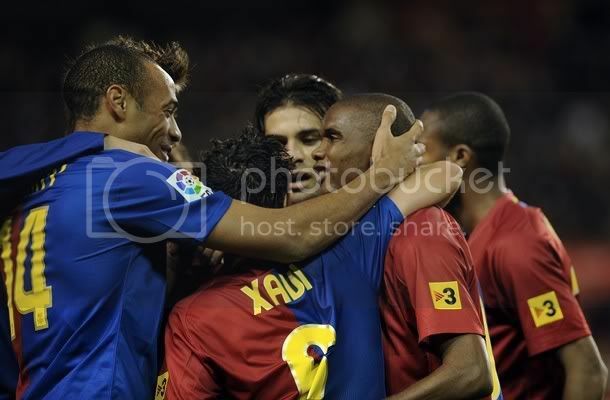 The second goal came in the 17th minute when Pique latched on to the end of a Xavi cross from corner. FC Barcelona went with a two goal lead to the half time. In the second half Henry was replaced by Bojan. In the 49th minute Alves played in Messi with a quickly taken free kick who rounded off Rui Patricio before slotting Barca's third of the night. Guardiola immediately took Messi off and put Pedro in his place. That move looked to have backfired with Sporting pulling two goals back in quick time. First it was Veloso who curled a free kick into the corner; the second came from Leidson after a Marquez's mistake. The recovery was short lived with Barca increasing their lead courtesy of a Caneira own goal after he tried to clear the ball off Busquets. In the 73rd minute Bojan was brough down by Patricio; he was expelled and a penalty was awarded. Bojan slotted the penalty to take Barca's tally to five goal and a welcome personal relief too. 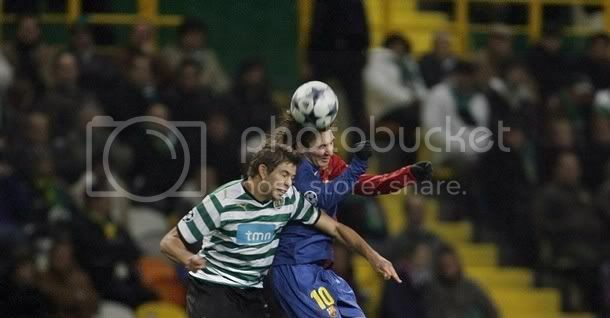 The clash between Sporting Lisbon and Fc Barcelona could be one of the most insignificant match of this round. With bot teams qualified for the knock-out stage, it could be the time for the coaches to give the lesser known players some playing time. But this match is more tricky for FC Barcelona than Sporting. Barca would like to top the group and avoid other top ranking clubs in the second round. Hence we can expect Guardiola to put up a good competitive side for this match. Taking a deviation to his usual policy; Guardiola announce the squad well in advance. 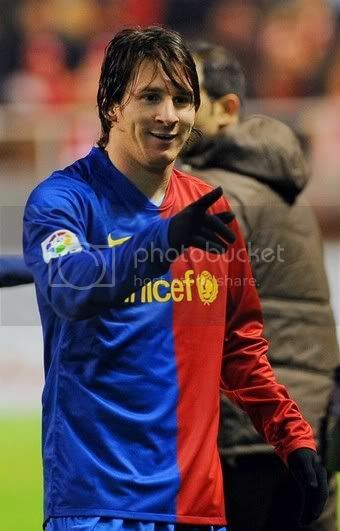 Messi and Marquez have been included in the side but Puyol and Toure are rested. That is a very good move considering those two gentlemen would be sure starters against Sevilla. 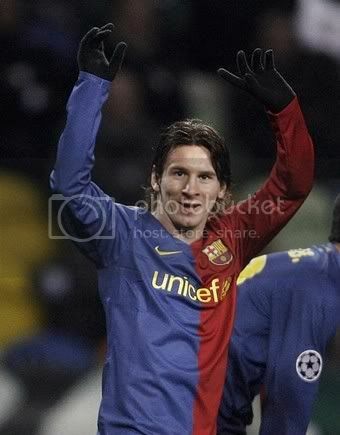 Messi could be expected to start but Guardiola is expected to rest Eto, Valdes etc. The squad announced is Valdés, Pinto, Alves, Sylvinho, Cáceres, Márquez, Piqué, Xavi, Gudjohnsen, Sergio Busquets, Víctor Sánchez, Keita, Hleb, Pedro, Messi, Henry, Bojan and Eto'o. I expect Guardiola to Pinto a start in place of Valdes. Pique, Caceres, Marquez and Sylvinho should make up the defensive line. The midfield is pretty tricky with Keita and Busquests expected to start with Victor Sanchez. Bojan should replace Eto on the centre of pitch with Henry on left and Pedro on the right. This could be a very tricky tie and we could do us a world of good if we come out undefeated. FC Barcelona fans and Management looks like is creating a habit of putting enormous pressure on new emerging talents. Last season it was Giovanni who wilted in the enormous pressure created and moved out of Nou Camp. Now it looks like this season it will be the chance of Bojan Krkic to be at the receiving end. 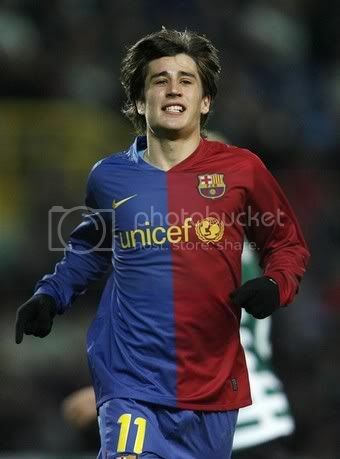 But in Bojan's case the move could be a temporary one, this is what Sport.es is reporting. Sport.es reports that Barcelona could be thinking about a loan move for the youngster since he is getting very few playing occasion. Bojan started for the fisrt time in league and had a torrid time wasting some good chances. He was substituted in the 55th minute and looked very much depressed by his own showing. Bojan sums up his performance as this "’m not happy at all with my own performance because this was my first start in La Liga and I wanted to do something special. But it didn’t happen.". There is so much to be read between in that statement. First of all is the fact that he is desperate to make a mark and grab Guardiola's attention. Every match whenever he has been brought in he has done the same. It is sad that no attempt has been made by the Manager to assure him. Many argue that this is a tough league and he has to toughen up to survive here. They point out the example of Messi's evolution as an example like last time they used to expel Giovanni. But they always forget the facts behind Messi's evolution. Messi was always given time to evolve as a player; he was always protected by his team mates; in terms of the burden of carrying the team it was Ronnie, Eto and Deco who carried us forward. 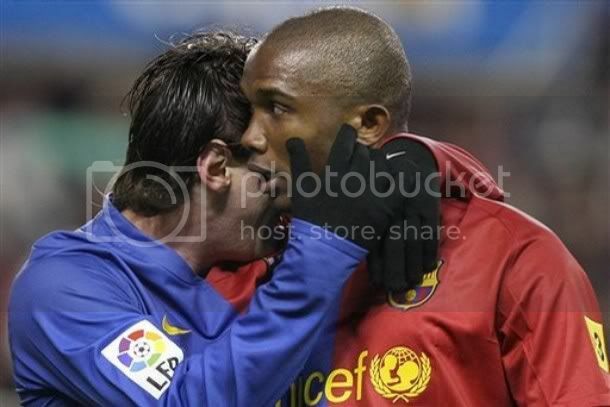 Messi was guaranteed of his position on the right always; there was only Guily to fight for that place. Bojan's case is different; he is supposed to fight with Henry, Gudjonsen, Eto for the centre forward place; add to this Guardiola's preference of Pedro, Busquests and Victor ahead of him. Naturally he is desperate to get attention of his coach. Most of the game he has been brought in as substitute in the later stages. But as usual Barcelona fans will never be ready to see these facts nor will be ready to give him time to learn the trade. There is a huge chance of him moving out of Barcelona atleast temporarily. Remember next season it will be Busquets or Pedrito. Is it too early to Dream about Silvervare?